Unsurprisingly, the responses were absolutely ridiculous. Highlights of the clip include Watters asking one female college student what costumes were offensive, to which she replied with the “politically incorrect,” term “Indians.” Watters corrected her saying “Native American,” and then the embarrassed student mumbled convoluted diatribe about “complex structures,” disqualifying whites from dressing as Native Americans. One man told Watters that President Trump scared him and his friends a great deal — So much so that his Californian friends are running bomb drills. College campuses across the U.S. are in full crackdown mode, banning costumes they think are offensive. 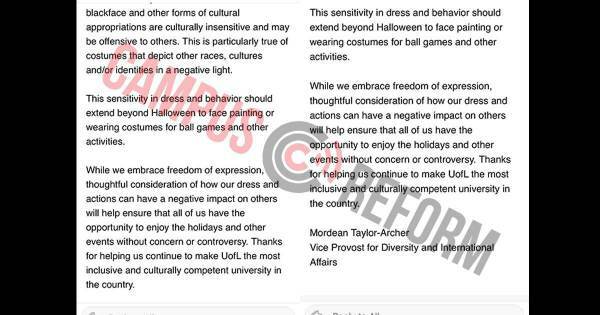 Various College campuses will hosts discussions about offensive Halloween costumes. Humboldt State University, for instance, plans to host a discussion Monday on how “cultures are disregarded, mocked, or simply dehumanized” by Halloween costumes, encouraging students to avoid “cultural appropriation” in their costume selections.